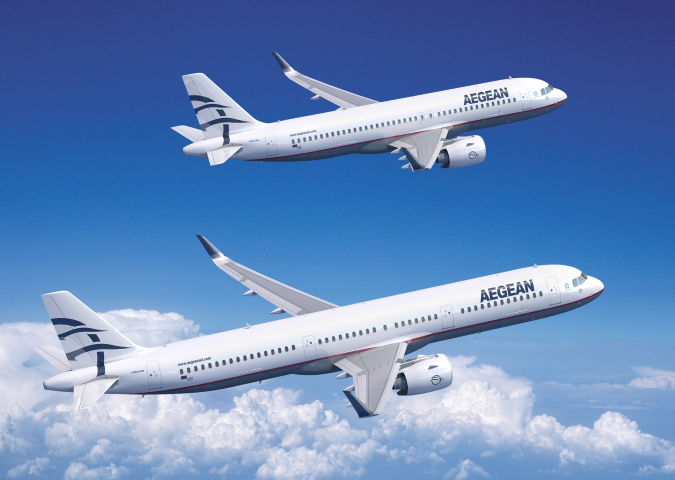 On June 22, Airbus reported that Greece’s biggest airline, Aegean, had firmed up an order for the purchase of 20 A320neo and 10 A321neo jets. The deal follows an earlier MoU signed in March 2018. The order was just one of many sizable Boeing and Airbus bookings in June. Boeing and Airbus delivered 82 and 80 commercial jets in June 2018, respectively, compared to 75 and 64 deliveries during the same month last year. June is traditionally a busy month for deliveries. Of key importance for Airbus, its persistent troubles with insufficient engine deliveries appear to be easing. In 2017, Boeing delivered 763 jets (748 in 2016), in line with company expectations, while Airbus surpassed its delivery target of 700 jets by handing over 718 aircraft during 2017 (688 in 2016). In June 2018, Boeing delivered 56 737s (of which 25 were 737 MAXs), ahead of the current monthly rate of 47 jets. The company also delivered one 747-8, two 767s, six 777s, and 17 787s. Boeing raised its 737 production rate to 47 per month in Q3 2017 from 42 previously, and will increase it further to 52 during 2018. Boeing plans a further increase to 57 737s per month next year. Boeing delivered 378 aircraft in the first half of the year and is 26 jets ahead of last year’s delivery figures. 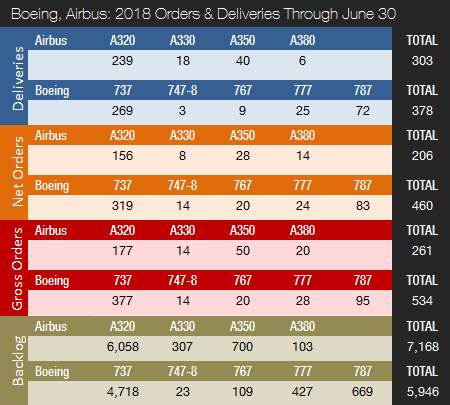 In June 2018, Airbus delivered 67 A320s (26 ceo / 41 neo), three A330s, eight A350s, and two A380s. Airbus delivered 303 aircraft in the first half of the year and is trailing last year’s delivery figures by three jets (was 19 jets behind in May). Airbus is struggling with late deliveries of engines from Pratt & Whitney and CFM International for the A320neo family of aircraft. Airbus’ CEO Tom Enders has stated that dozens of A320neo aircraft are sitting on the tarmac in Toulouse and Hamburg, awaiting their engines. 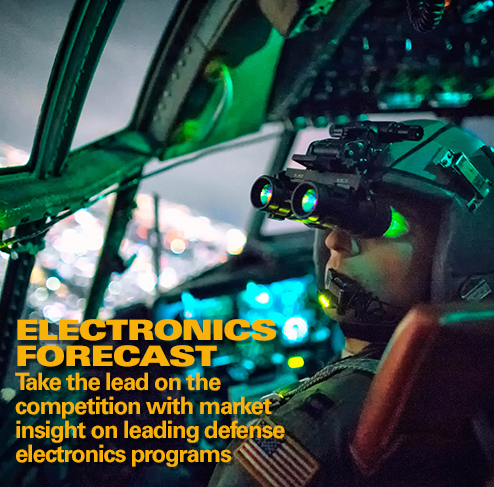 Despite the difficulties, Airbus confirmed its full-year outlook when it reported first quarter 2018 financial results in April, and in June 2018 the situation was reported to be improving. A total of 181 A320neo family aircraft were delivered in 2017 vs. Airbus’ forecast of 200, up from 68 during 2016. By mid-2019, Airbus expects to be delivering 60 A320 jets per month. 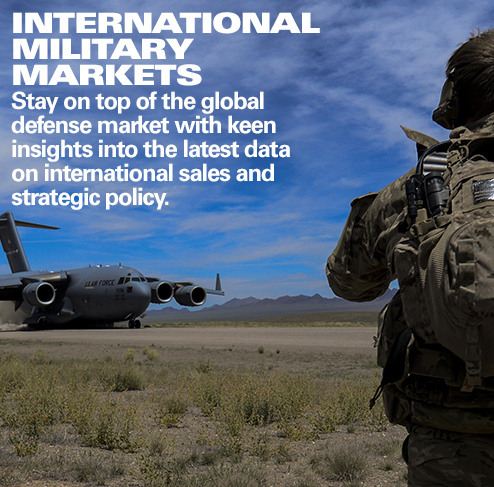 The company has internally been debating rates beyond 60. Airbus plans to deliver up to 120 A350s (all variants) in 2018 when the production rate hits 10 per month. Airbus is considering a further increase up to 13 A350s per month in 2019. The ramp-up of A350 XWB deliveries combined with a higher A320 production rate means that the company is narrowing Boeing’s deliveries lead and could surpass its top rival by 2019 or 2020. 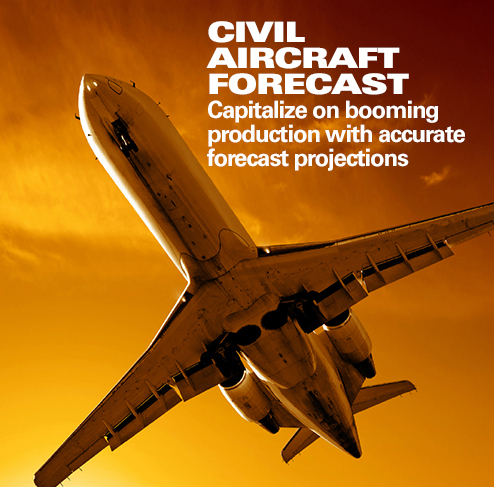 In April 2018, Boeing announced plans to increase its 767 production rate to 3 jets per month from 2.5 beginning in 2020. This is due to strong air cargo growth, which has increased demand for Boeing’s 767-300F variant. In June 2018, Boeing logged 233 gross orders (minus four cancellations => net of 229). 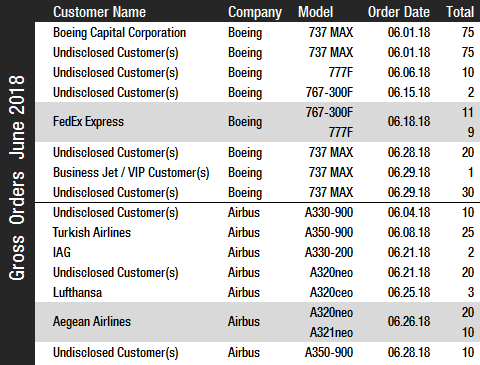 Boeing’s June bookings included 201 737 MAX orders, including 75 for Boeing Capital Corporation (BCC), 75 for an undisclosed customer (believed to be India’s Jet Airways – note that this order was initially booked by Boeing on March 31) as well as another 50 combined for two other undisclosed customers, and a single aircraft for a bizjet/VIP customer. Other key orders were nine 777Fs and 11 767-300Fs for FedEx and 10 777Fs for an undisclosed customer. Clearly, orders for cargo aircraft are picking up. 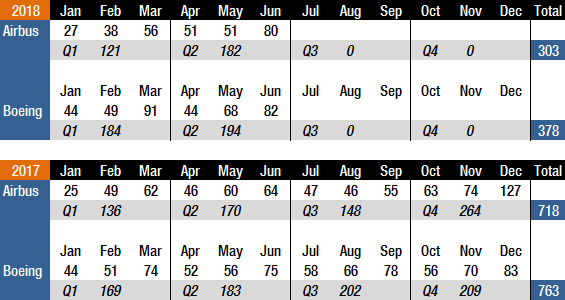 Airbus’ June bookings totaled 100 gross orders (minus five cancellations => net of 95). Leading the sales activity was a substantial order for 25 A350-900s placed by Turkish Airlines, an order for 20 A320neos and 10 A321neos for Aegean Airlines, an order for 20 A320neos for an undisclosed customer, an order for 10 A350-900s (undisclosed), and a rare order for 10 A330-900s (undisclosed). Despite being well behind Boeing in this year’s orders race, Airbus has retained an orders lead over its rival every year since 2012. In 2017, just as Boeing looked set to win the orders race, Airbus finished the year on a very high note and reported a full-year intake of 1,109 net new orders, ahead of Boeing’s 912. 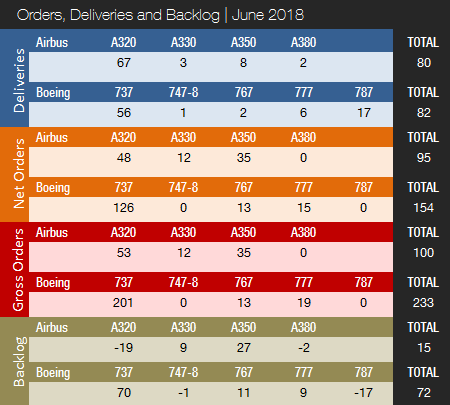 Airbus’ order backlog as of June 30, 2018 stands at 7,168 jets (of which 6,058, or 85%, are A320ceo/neo family narrowbodies), ahead of Boeing’s backlog of 5,946 aircraft (of which 4,718, or 79%, are 737 NG/MAX narrowbody jets). Boeing’s backlog set a new all-time high in June, surpassing the previous record of 5,904 jets set in April. Airbus is 97 jets below its all-time record backlog of 7,265 set in December 2017. The number of Airbus aircraft to be built and delivered represents a 10-year backlog at the 2017 production level. In comparison, Boeing’s backlog would “only” last 7.8 years. As indicated above, Airbus booked 1,109 net new orders in 2017, resulting in a book-to-bill ratio of 1.54. Boeing booked 912 net new orders in 2017, for a book-to-bill ratio of 1.20. 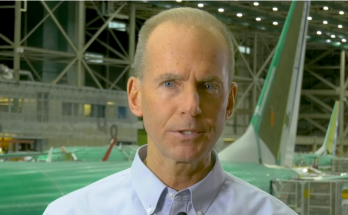 In 2018 to date, Boeing boasts a book-to-bill ratio of 1.22 (1.03 in May), with Airbus at 0.68 (0.50 in May).